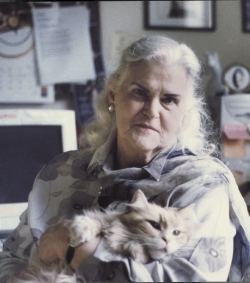 As you probably know, SF/F giant Anne McCaffrey passed away November 21 at the age of 85. Like many of you, I grew up reading her work, in particular the Pern novels and the Crystal Singer trilogy. I remember being very impressed with her strong, capable heroines. I’ll always carry with me the memory of Lessa from DRAGONFLIGHT. She’s a survivor, a fighter, a warrior, a lover. Characters like Lessa went a long way toward shaping my taste for heroines in both science fiction and romance. Despite the role that forced seduction played in the romance between Lessa and F’lar, that’s not what I remember about her. I remember her being a heroine with agency, one who comes into a considerable amount of power. She then learns to channel her powers for the greater good. A great character arc, and pretty subversive stuff for 1968. Words can’t express what Anne McCaffrey’s work meant to me (well, perhaps this blog does!). She was a true pioneer in the SF/F field, and I’ll always be grateful for her perseverance, vision, and amazing storytelling ability. If you have any special memories of Anne McCaffrey’s work, I’d love to hear about them.